In the afternoon of January 9, at the Okinawa Prefectural Office, the plaintiffs group and legal team explained the suit to seek cancellation of the approval of Henoko landfill. The plaintiffs group and legal team of 126 people has been seeking cancellation of the approval of the Henoko landfill by initiating an administrative lawsuit. 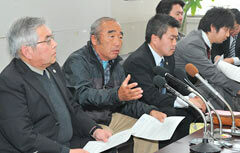 They held a press conference at the Okinawa Prefectural Office on January 9. The suit is against the Okinawa Governor Hirokazu Nakaima. The governor approved last December the application to carry out the landfill at Henoko to move U.S. Futenma Air Station. Article 4 of the Public Water Body Reclamation Act requires that the landfill work properly and reasonably use national land. The act also requires the work to be environmentally friendly. The landfill approval by the governor does not meet the requirements of the act. The plaintiffs and legal team are filing a suit against the Okinawa Prefectural Government. They seek cancellation of the approval. At the same time of the filing the action, they seek the stay of execution of the approval. The plaintiffs are six residents of nearby neighborhoods such as Henoko and Kushi, 19 citizens from other parts of Nago, and 101 residents from other parts of Okinawa. The fishers, eco-tour operators and nature photographers will take part in the lawsuit. Destroying the environment adversely affects their livelihoods. The owners of land within Camp Schwab will also participate. Toshio Ikemiyagi became the leader of the defense group. The group plans to gather more plaintiffs and is considering filing more actions.